giving a blow by blow account of every pile driven and a day to day productivity record. 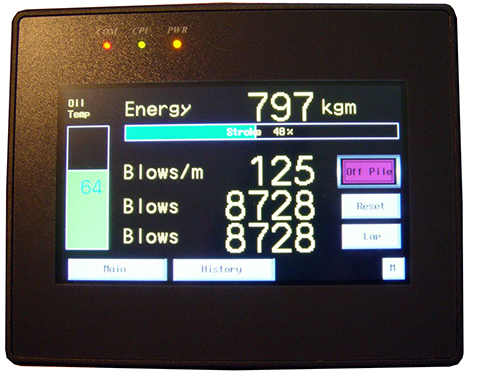 The main screen displays bar graphs showing hammer stroke & hydraulic oil temperature. An Off Pile indicator confirms when the hammer is securely seated on the pile, and allows piling to commence. There are numerical read outs showing blows per minute, energy per blow and total blows. The lower reading shows blows in LAP cycle. (Measuring blows per increment). The units can be changed from imperial to metric. The history screen provides information on the total number of start ups / total hours / total blows and total energy through out the life of the hammer.